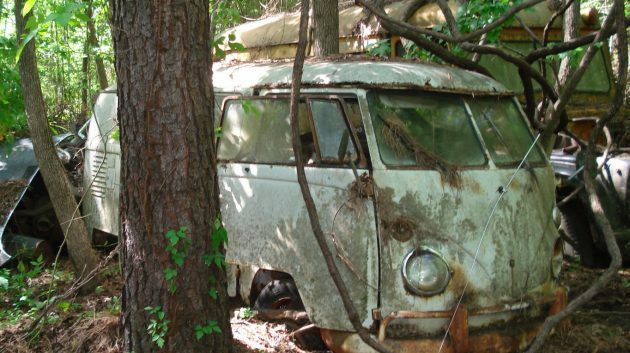 The seller of a tree-trapped 1963 VW Bus is listing it for his father, who seems to live in rural Texas and hasn’t driven this split-windshield Kombi in many years. Though limited on the details and unable to take new pictures on the fly (as he lives several hours from his dad’s place), the listing is fairly straightforward about what you’re getting yourself into. 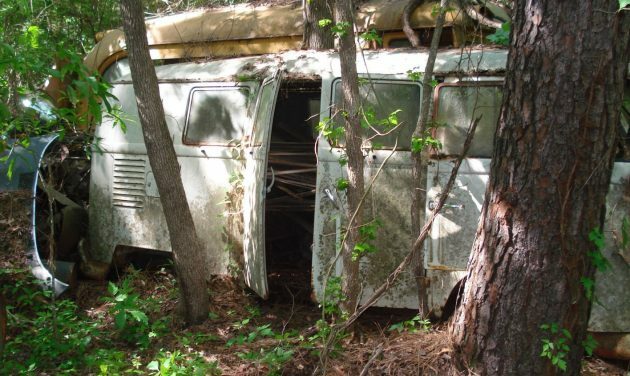 Find the aging VW Bus here on eBay where bidding is up to $3,750 with no reserve. 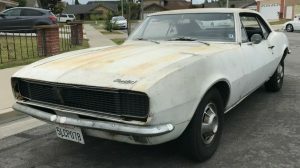 The seller notes he has no way of confirming whether the engine is still with the Bus, as there is too much debris in front of the engine cover for inspection. 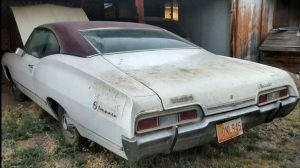 In addition, it sounds as if he is not returning to his father’s property for more pictures, so the presence of an engine will be a mystery for the next owner to solve. Frankly, so many of these things had their engines swapped out over time that even if an engine is present, it’s not likely numbers matching. No word on the transmission or its health. The van was purchased new by the seller’s father in 1963 and was then parked – permanently – just four years later. The seller suspects mechanical woes sidelined the Bus as there are no obvious signs of accident damage. 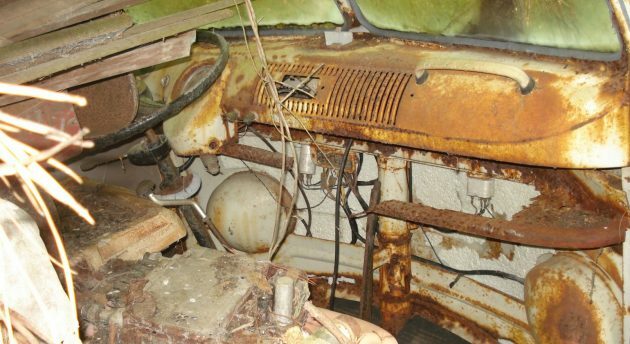 Still, rust is prevalent, including in the roof trim and in the front quarters, but it is far from the rustiest Bus we’ve seen rescued and restored. The rear seat frames and springs are included, but it’s hard to spot them with piles of wood chips on the inside. It sounds like the current owner uses the Bus as a storage shed, which is surely made easier with those handy barn doors. Since we haven’t even seen the floors (and no one will before the auction’s end, it sounds like), there is definitely a calculated risk involved if you’re pondering a Bus rescue. But the early examples do tend to be worth a bit more, and the presence of barn doors and a relatively complete shell will make this one a compelling project for the DIYer bodyman. Just be prepared to do some digging and unloading before strapping this Bus to a trailer, or maybe hire the helicopter crew that pulled an early Bus out of a marshy bog! Looks like a project that only someone with serious ambitions, skills and bucks can take on. I’ll pass. Proof positive, folks, this is all that’s left. One of the worst so far. Does that somehow make them more valuable? The car, or Jay M’s hemmoroids? The speed bumps, of course…. I once went to a scrapyard in upstate New York where the trees were growing through 40’s and 50’s cars — it was a nice walk. This pile of crap isn’t even worth the effort to list it. Must be a slow news day at Barn finds…. Some people are interested, as the bidding is $4000.00 . The sky seems to be the limit with these vans. Looks like, at minimum, there’s some fodder for another episode of American Pickers here. I would rather buy the one that was in pieces that was on BF’s a while back over this one. If the top looks that bad, think of what the bottom that has been setting in the ground for who knows how many years must look like. The poor thing will just fall apart if you try to move it, let alone using a fork lift to lift it. Dan must be right about a slow day. Um… maybe??? MOVE the debris!! Correct me if I’m wrong (and I’m sure I can count on that!) but weren’t the Kombi’s & the Beetles built on pretty much the same platform? Other than moving the pedals and shift linkages can’t these be saved by sliding a new pan underneath? Otherwise it could be salvaged as a sandwich bar at JFK. If memory serves me correctly the Beetle had a bolt on body but the Kombi was welded to the floor pan. 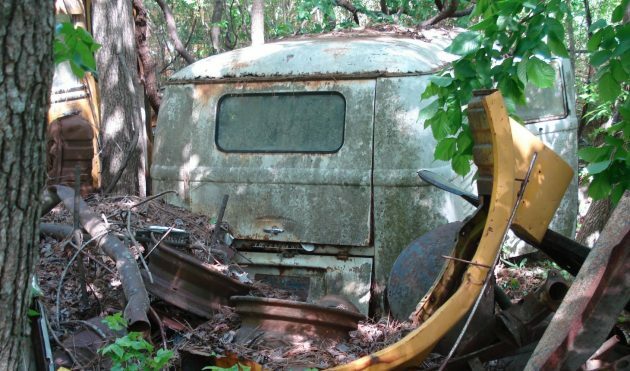 Those VW bus fanatics are lunatics, I’m certain this will be fully restored in no time. Given all the trees around his poor split window, I feel OK going out on a limb in predicting buyer’s remorse if this deal actually gets done. $95,000. That’s my final offer. The parcel shelf under the dash has rusted away. There’s still a bit of it that can be seen on the right, above the headlight bucket, and a small piece under the speedo pod. Astonishing! Feel like I’ve already seen this one on American Pickers — that show gives you insight into the thinking of some of these sellers: ignore it for 50 years, and when you find out it’s desirable, mark it up 500%. Bless their hearts, if someone is silly enough to spend a hundred grand restoring it, the seller certainly deserves their fair share as well. …ashes to ashes, rust to rust…… For the sake of sanity and humanity, let the earth reclaim it. Somebody is buying the VIN to swap onto a brazillian bus, i bet.